Thank you all bass players around the world for your entuthiasm and appreciation of the Double Trolley over the years! I'm now pursuing new projects that will be even more exciting! 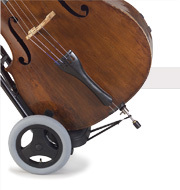 The Double Trolley is the unique solution for any double bass player who wants a safe transport system for the double bass, and a high quality adjustable stool upholstered with genuine leather - all in one! In under 10 seconds you can transform the Double Trolley into a high quality stool and vice versa. 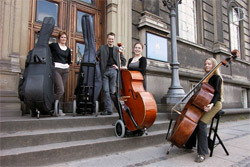 4 early users of the Double Trolley in Copenhagen, Denmark. "The Double Trolley is an ingenius initiative. 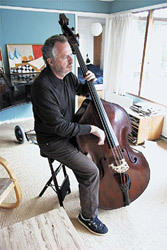 At once it solves the two major problems for all bass players: It eases transportation and at the same time delivers the best bass stool I have ever sat on."